Add one tablespoon butter to a non-stick frying pan and add the mushrooms. Sautee over low heat for approximately 5 minutes, remove mushrooms from pan and set aside. Add a little more butter to the pan and add one quarter of beaten egg mixture, lift the edges of the omelette so the egg can run under and set. 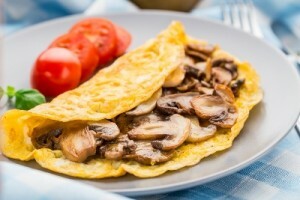 Once the omelette is almost set add one quarter of the cooked mushrooms and sprinkle with a little bit of the cheese. Fold the omelette over and gently place on the serving plate. Repeat 3 more times with remaining ingredients.